Inspiration classroom furniture is both ergonomic and cool - student desks, chairs and combination units that are super comfortable and good looking too. 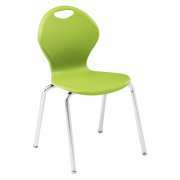 Inspiration school furniture is made from top quality materials and comes in an assortment of great colors. Administrators love the value, students like how they look and feel, and teachers love how students don?t fidget as much and stay focused in class. 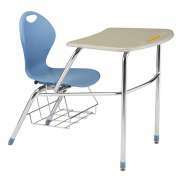 Our Limited Lifetime Warranty and great pricing help these classroom chairs and desks provide exceptional value for years to come. The decidedly modern, curvy designs of Inspiration classroom chairs and school desks will give your learning space a whole new look. 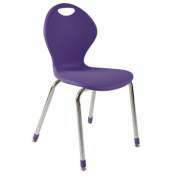 With ergonomic comfort at budget-friendly prices, this school furniture can be enjoyed in any educational setting. With a durable design that incorporates the latest looks, trends and colors, you get the best of everything. Inspiration combo desks, preschool tables and drafting chairs have the features you need to enhance any modern classroom environment. With tons of colors, sizes and special design features to choose from, this classroom furniture can be coordinated with your decor and custom requirements. One great thing about having the Inspiration classroom collection is that you can get all of the chairs and desks you need for your school in one place. When you order a number of pieces from the same line, you also know that they will look good together. Rather than hunting around for sizes and styles that match and fit correctly, you can rest assured that everything will synthesize well in your space. School chairs might just be the most important classroom furniture for your students. 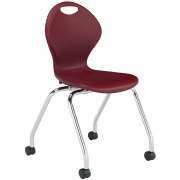 Student chair design determines how comfortable your class will be. Well-supported students won&apos;t be distracting themselves and their friends by constantly shifting in their seats, but you can bet that uncomfortable students will. With proper support, you can help children maximize their productivity in class and get as much as they can out of each and every lesson. 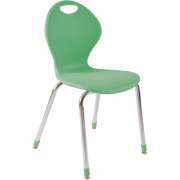 There are lots of special design features that make inspiration classroom chairs uniquely suited for a modern learning space. 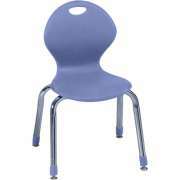 Soft plastic shells with flex action let students lean back and get comfortable without causing damage to the chair. Sturdy support is supplied by 17-reinforcement ridges and a 16-gauge steel frame. For extra convenience, a built-in carry handle and stacking capabilities make transport and storage easier than ever. Beyond the basic design which is part of all Inspiration classroom seating, there are lots of choices and custom options to consider. A selection of heights lets children in any grade sit properly. With tons of shell colors, you can choose one hue which works well with your space or brighten up the classroom with a colorful selection. Bookboxes are great because they eliminate work surface clutter while providing students with an accessible space for their books. 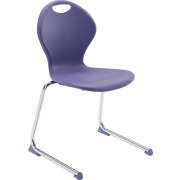 With casters on the bottom of school chairs, a classroom can be rearranged without and lifting at all. While the standard four-leg design is functional, it is not always the ideal choice just because it is the obvious one. 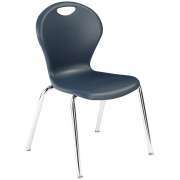 For schools on a tight budget, the value chair option can really make a difference, especially when you are ordering in large quantities. cantilever chairs have a futuristic design which maximizes legroom in a cool contemporary way. 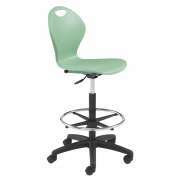 Swivel chairs are perfect for the computer room or science lab where students need to access a larger surface comfortably. 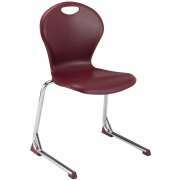 Especially in a high school setting, there may be students who don&apos;t fit in the standard-size student chairs. Besides making people uncomfortable, chairs that are not built to hold the people sitting in them can potentially get damaged and cause injury. The Inspiration XL Series fits right in with regular Inspiration models, but supports taller, broader students. With extra reinforcement ridges, a higher weight capacity and wider seat, the XL chair ensures that every member of the class has an appropriate place to sit. 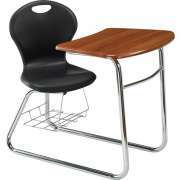 Once you have chosen some student chairs, you are going to need some classroom desks as well. 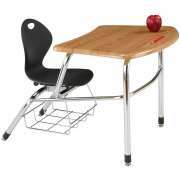 The curved ergonomic tops and colored bookboxes of Inspiration school desks look cool and really help students in class. With 18-gauge steel, height-adjustable desks, it is easy to make sure that work surfaces are at a comfortable height for your students. Choose student desks with colored accents that coordinate with classroom colors or find a complementary hue that will add a bit of diversity to the space. 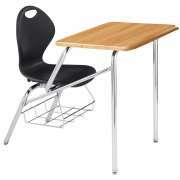 Many schools prefer to have combo desks rather than having separate school desks and classroom chairs. An Inspiration student chair desk gives you the unbeatable design features of inspiration chairs combined with tough, lightweight WoodStone desktops. Combo desks save money and ensure your chair and desk heights always match up. If you have the right number of student chair desks in the room, you know that class is ready to start and students won&apos;t have to wander around looking for a missing chair or table. While classic combo desks are usually a good choice, sled-base units are ideal for carpeted floors. 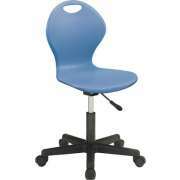 There is also the swivel chair option which makes it easier for students to slide in and out of their seats. In addition to the basics, the Inspiration school furniture line also offers a great plus-shaped preschool table. The shape is great because it lets students work individually, in pairs or in larger groups all while seated at one school table. With the increased focus on collaboration and group work in today&apos;s classrooms, this shape is an ideal choice for any early-childhood setting. Inspiration drafting chairs are another wonderful option for schools with an art room or design studio. Let the Inspiration series inspire some serious innovation, development and growth among your students. With so many great pieces and design features to choose from, students of every age in every type of classroom can enjoy contemporary styling and unbeatable comfort.